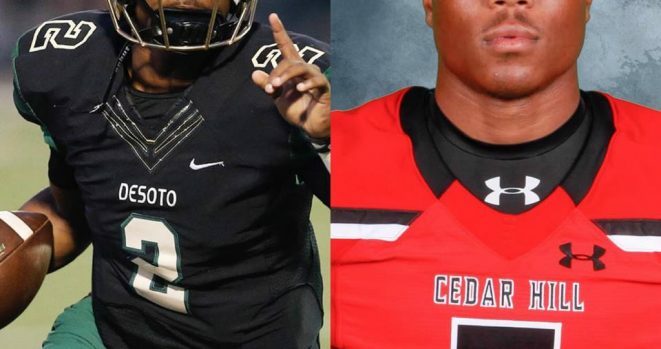 This week’s K104 Friday Night Lights “Beast Of the Week” game balls go to Shun’Darion Ward of DeSoto and T’mar White of Cedar Hill! Shun’Darion Ward (DeSoto) – It was a shootout between DeSoto and Waxahachie and Shun’Darion Ward was near perfect! Ward went 33-36 in passing attempts, throwing for 451 yards and five touchdowns! He added 100 yards rushing and another TD on the ground. T’mar White (Cedar Hill) – The Cedar Hill defense is showing why they are one of the best in the state after a big shutout win against Grand Prairie. White boasted eight tackles, two forced fumbles, two fumble recoveries, and two pass breakups in the Longhorns 45-0 win.